Vision systems are playing an increasingly important role on the battlefield, with high-bandwidth video improving surveillance and intelligence while helping keep troops out of harm’s way. In a local situational awareness (LSA) system, for example, real-time video is transmitted to display panels for crew members to navigate the windowless ground-based vehicle and survey surroundings. In these sophisticated LSA systems, video and data from multiple imaging sources must be shared across multiple endpoints – including computers used for automated analysis and display panels for human observation – over a common infrastructure. Early military vision systems used point-to-point interfaces to connect endpoints. These umbilical connections, based on analog, Camera Link, or low-voltage differential signaling (LVDS) interfaces, required a dedicated cable between each imaging device and its endpoint. In applications such as a vehicle electronics (vetronics) system, cabling becomes costly, complex, heavy, and difficult to manage and scale. In addition, these interfaces require a PCI frame grabber at each endpoint to capture data. Ultimately, these legacy interfaces limit component choice, increase costs, and result in more complex systems. To address these issues, military system designers are migrating to networked digital distribution technologies perfected in the factory automation market to meet cost and size, weight, and power (SWaP) demands, support future scalability, and simplify usability by sharing video across an integrated Ethernet network. As automated quality inspection and robotic manufacturing migrated from research labs to factory floors throughout the early 1990s, system designers struggled with the same cost, performance, and scalability concerns confronted by today’s military imaging manufacturers. Primarily, these industrial vision systems required dedicated, heavy, and inflexible cabling to connect cameras with processing, analysis, and display platforms. Frame grabber cards were needed to capture video at end-points, which limited design choice to larger footprint, more expensive computing platforms. Proprietary approaches to managing video made it difficult to scale multi-vendor systems and network images feeds to various end-points. Industrial vision evolved into a viable commercial technology when it adopted Gigabit Ethernet (GigE) as platform for highly reliable real-time video delivery and networking. With Ethernet, vision system designers are able to support required point-to-point connections while gaining the flexibility of video networking, the ability to interwork with a range of different computing platforms, and deploy light-weight, low-cost, commercial off-the-shelf (COTS) Cat 5/6 cabling. GigE is a natural choice for video transmission in military imaging systems. Images and data from cameras and sensors are streamed directly over standard cabling to an Ethernet port on a processing platform. Freed from the need for a peripheral card slot, designers can choose from a broad selection of ruggedized, small form-factor and low-power computing platforms for image processing and control. The flexible, lighter, field-terminated Ethernet cables cost less and are simpler to install and maintain than the bulky cabling and connectors of legacy interfaces. 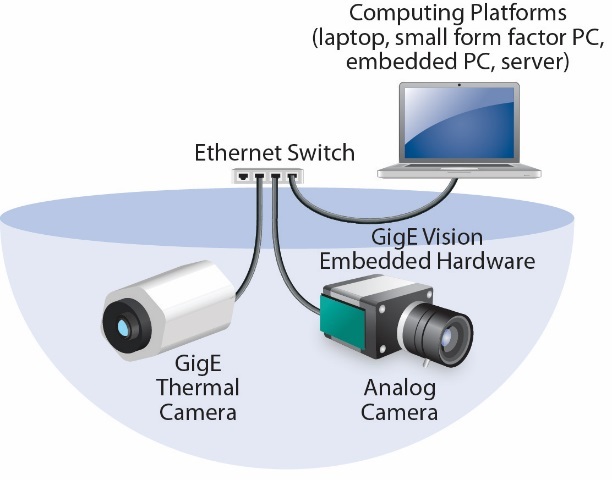 Further, the flexible point-to-point and point-to-multipoint networking flexibility of GigE allows images from multiple cameras/sensors to be aggregated to a single port on a mission computer or processing unit, and/or imaging data to be multicast from one camera/sensor to multiple displays. In Ethernet-based system built with quality components, end-to-end (or glass-to-glass) latency is less than 80 milliseconds. A complex set of British, NATO, and American standards outline the mechanisms and protocols for distributing digital video over Ethernet infrastructure. While these standards are intricate, design approaches adopted by the machine vision industry helps designers meet their overarching goal to simplify design and lower costs, ensure interoperability, and support easily scalability. Def Stan 00-82 defines an architecture that helps lower costs and improve performance for end-users. With an architecture based on open standards and protocols, multi-vendor solutions can be integrated into a system, the same technology is easily redeployed across multiple platforms (for example, different vehicle types), and the system can be upgraded with more advanced sensors, displays, or processing systems. Video sources and display endpoints may have an integrated Ethernet interface, or interface modules can be used to convert legacy connections into Ethernet. For end-users, the system must support complex multicast transmission of the full range of video formats and resolutions and metadata, with flexible control mechanisms to distribute images and data to processing units and display panels without reconfiguring hardware or software. For example, uncompressed video used by the driver to navigate the vehicle can be shared with crew members for surveillance and observation and compressed for archiving purposes. Figure 1 illustrates a video distribution network for a vetronics navigation and targeting system distributing and accessed Def Stan 00-82 compliant video over a GigE architecture. Video from legacy analog image sources and newer HD-SDI or GigE cameras is streamed to a rugged Ethernet switch and multiplexed over a 10G Ethernet switch interconnect. The platform’s centralized image processing accesses the video from the multiplexed streams and performs image fusion, stabilization, enhancement, or stitching as required. Processed images are then fed back to appropriate displays and workstations in the vehicle. Figure 1: Def Stan 00-82 compliant video streamed over a GigE architecture for a navigation and targeting system. Similarly, the the U.S. Department of Defense Vehicular Integration for C4ISR/EW Interoperability (VICTORY) initiative was first introduced to avoid interoperability and scalability issues during “bolt on” retrofit upgrades of land-based vehicles. Today, VICTORY guidelines also encompass new situational awareness system design. Developing imaging systems based on Ethernet technologies helps designers meet two critical objectives of the VICTORY initiative: the use of COTS products and technologies to enable multi-vendor integration and avoid vendor lock-in; and careful component selection to help reduce SWaP in space-constrained vehicles. Considering the basic aims of VIVOE, NGVA, and VICTORY, Ethernet-based imaging systems ensure interoperability in a fully networked, multi-vendor environment. Designers can leverage the performance benefits of Ethernet, including lighter and longer reach cabling, networking flexibility, full-duplex connections, and support for uncompressed and compressed video. Imaging systems can be designed based on COTS technologies, including networking equipment, PCs, laptops, and displays, with a scalable architecture that enables future addition of new imaging sources, displays, and processing technologies. 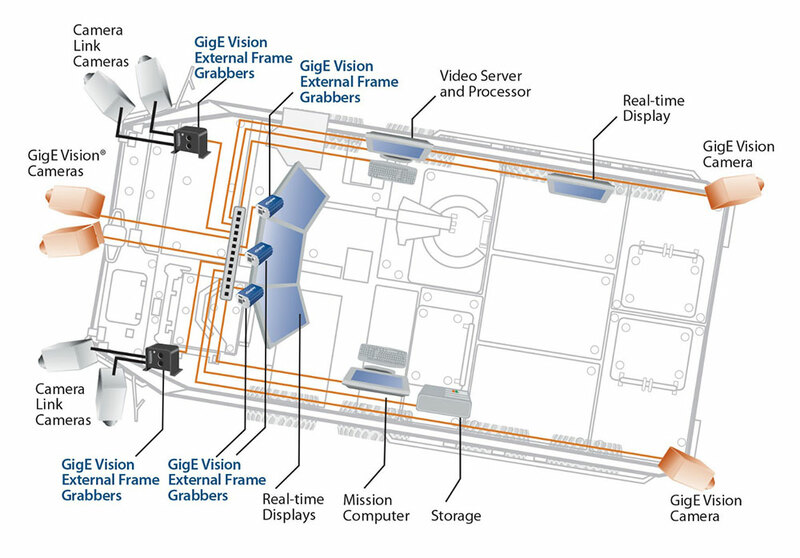 GigE allows manufacturers to easily upgrade or design vision systems for military ground vehicles that integrate different types of cameras, displays, and processing computers into a single, all-digital, real-time video network. 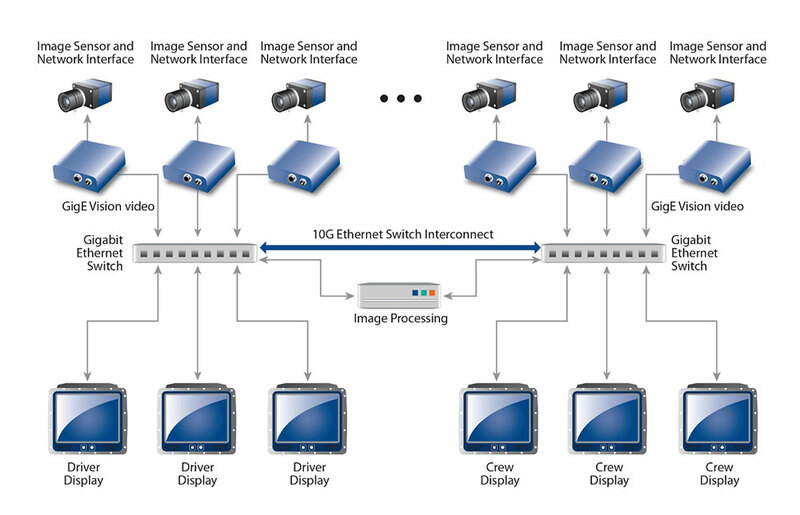 In a LSA application (Figure 2), real-time video from analog cameras is converted to an uncompressed GigE video stream and delivered over the multicast Ethernet network to displays and processing equipment at various points within the vehicle. Video, control data, and power are transmitted over the single cable; lowering component costs, simplifying installation and maintenance, and reducing “cable clutter” in the vehicle. Figure 2: Video is converted to Ethernet packets by an external frame grabber and streamed over the multicast Ethernet network to displays and processing equipment at various points within the vehicle. All computers used for processing and mission control connect to the network via their standard Ethernet port, eliminating the need for a computing platform with an available peripheral card slot. Instead, system designers can employ ruggedized laptops, embedded PCs, or single-board computers for image analysis and control to help lower costs, improve reliability, and meet SWaP objectives. With all devices connected to a common infrastructure and straightforward network switching, multiple streams of video can be transmitted easily to any combination of mission computers and displays. Troops can decide “on the fly” which video streams they need to see, without any changes to cabling or software configurations, or use the on-board mission computer to combine images for use by others in the vehicle. For example as illustrated in Figure 3, the video feed from visible light cameras can be converted to Ethernet packets and blended with video from a native GigE thermal camera to provide more detail on a region of interest. Figure 3: Images from an analog camera are converted into Ethernet packets and blended with video from a native GigE thermal camera. For military applications, real-time video is enabling new generations of vision systems that cost less, weigh less, and are easier to use than systems based on legacy point-to-point standards. Beyond LSA systems, Ethernet-based video solutions are ideal for vision systems for sighting, threat detection, weapons targeting, and surveillance in naval vessels, manned and unmanned airframes, and standalone systems for persistent surveillance. Marc-Andre Casavant is an engineer with Pleora Technologies, a leading supplier of video interface products for military, medical, and machine vision applications. Contact him at Marc-Andre.Casavant@pleora.com or visit www.pleora.com.